Christianity needs a powerful voice in today's world. Such a voice can come only from strong leaders guided by God and devoted to Christ. Spiritual Leadership will encourage you to place your talents and powers at His disposal so you can become a leader used for His glory. This edition has been been completely revised. The language is updated with a modern flavor and a study guide has been added, designed as a tool to help you grow and successfully apply the principles in this classic book! to pick up your FREE copy!!! 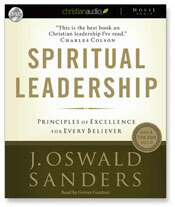 for bringing you the audiobook download of Spiritual Leadership for FREE! Here is a little "fun-sermon" for you! Do You Ever Lose Your FOCUS? Not Where You Want to Be in Life? "Each ONE Can Reach ONE"